The broad selection of laminate flooring in Modesto, CA, available at our flooring store ensures that your next design makeover project will turn out exactly how you’d planned. 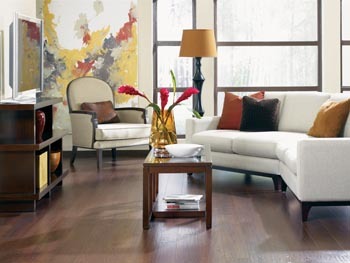 With our cost-friendly pricing, you’ll be able to enjoy a stylish floor without having to break the bank. In addition to our financially effective prices, The Floor Trader of Modesto offers financing options that allow you to spread your payments out over time. That way, your flooring investment will be more economically manageable, so you can focus your attention on the style you love instead of being limited to a certain price range. Our laminate floors include options that match the appearance of wood, ceramic, and stone in a wide range of colors and designs, so you’ll have an extensive array of products from which to choose when you visit our showroom. By combining resilience and versatility with an appealing aesthetic, our laminate floors make an ideal selection for any room of your living area. For performance, value, and appearance that upgrade the quality of your home’s floors, consider the advantage of new laminate flooring for your next interior renovation project. While stone tile flooring is a highly desired product for many homeowners, it isn’t a luxury that everyone can afford. Fortunately, our laminate tile flooring offers the look of high-end stone at a more cost-friendly value. If you’re looking for a floor that resembles the appearance of natural slate or marble, then you don’t have to settle for less. With a special printing process that is designed to make laminate floors appear more like tile than ever, no one will know the difference between natural stone and laminate by simply looking at your new floor. In addition to the top-rate selection of floors that we offer, our crew of professional contractors provides complete laminate flooring installation. Rather than wasting time, money, and energy searching for a contractor from another company or trying to install your floor on your own, you can depend on our skilled experts to fit your floor in your home. With our knowledgeable staff on your side, you won’t have to worry about problems with your floors in the future. We utilize the latest in flooring installation technology and bring years of hands-on experience to every project that we perform. Contact us to learn more about our laminate flooring. We serve clients in Modesto, California, and the surrounding areas.